Reviews: (12) See bottom of the page to read them and then share your thoughts! 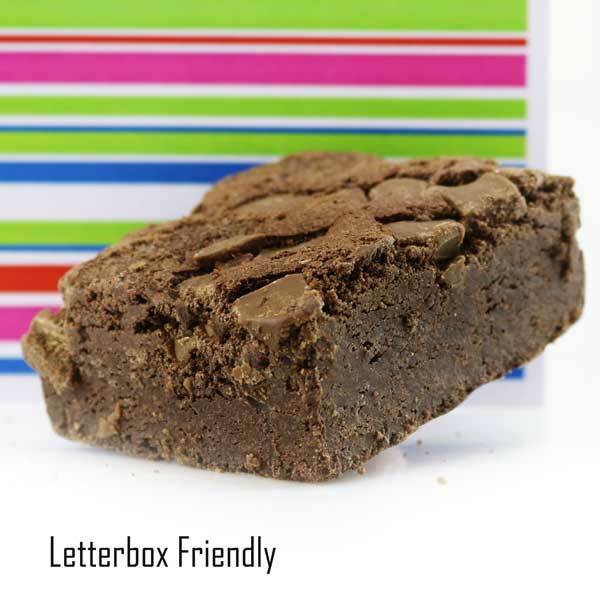 Brilliant Brownie Square 70g - wonderfully chunky and luxuriously rich! Milk and dark Belgian chocolate mixed with a little magic this chocolate chip brownies are not only indulgent, but a piece of pure heaven! A Brownie that any girl guide would be proud of! Gluten Free. Suitable for Vegetarians. Lovely gift idea. The brownies were well received and I'm told delicious! My sister loved the brownies! Very pleased with the service I received. Will certainly be using you in the future! sometimes only a brownie will do! I'd like to think I can bake and send but the reality is I haven't time, skill or frankly inclination but sending with these guys is brilliant. Brings a smile to the face of the recipient and brownie points for the sender - perfect combo! Absolutely gorgeous. A scrumptious, soft but texturized brownie. Not too heavy but deliciously sweet. Would have one every single day if I could! I ordered these to be delivered to my sister in law who doesn't live near me.neither of us drive so it's very practical for sending gifts and letting people know you haven't forgot them!! these brilliant brownies are amazingly delicious and very very good as a gift or a treat. I've used sugar poke a couple of times now as birthday treats for my sisters and have been greatly impressed each time! I'm told the gifts not only arrived on their birthdays (as instructed!) but that they taste great! The perfect gift that can be delivered home or to work (to make all the colleagues jealous!). Super impressed. I ordered these for my son and he states they are 'the best brownies EVER!'. Needless to say, he is a HUGE fan of Sugar Poke. Great tasting Brownies, Had several, now working them off so i can be back for more.